The following story is an exercise often used to teach English language learners new tenses. Students were asked to rewrite this story in the past tense and then answer the question at the end. Why don’t you answer it too? 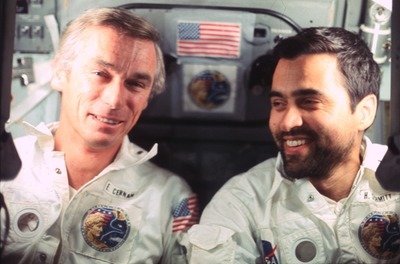 THE last people to walk on the moon are Astronaut Gene Cernan and Astronaut Jack Schmitt. The year they walk on the moon is 1972. The computers on their spaceship have less power than a mobile phone today! The astronauts live on the moon 3 days. They walk on the moon collecting rocks and dust. They walk on the moon 22 hours and walk 36 kilometers. They collect almost 115 kilograms of rocks and dust! At night, they live in their “moon home,” the Lunar Lander. 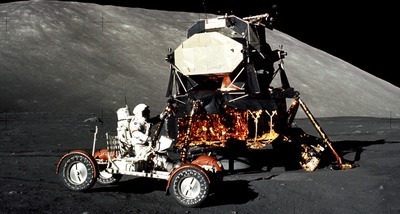 The moon car they ride in is the Lunar Rover. 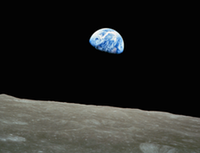 Astronaut Cernan remembers how beautiful earth looks from the moon. His daughter remembers something else! His daughter remembers her father's promise. She asks her father to write her initials on the moon. He writes TDC on the ground on the moon: Teresa Dawn Cernan. Now pretend you go to the moon. You leave a message behind for someone else to find. What do you write on the moon?! Students in Nepal answered: I would write . . . I would draw a picture of the Nepal flag. The name of my village in Nepal. Students in India answered: I would write . . . The Moon is a world like this one and Earth is its Moon. Students in Afghanistan answered: I would write . . . The names of all my family members. A student in Russia answered: I would write . . . If you are reading this, it means people are still alive on earth. I am leaving you this message: I hope people on earth can learn to stop spoiling it and finally live happily on it.